With that in mind, we decided to create a sample report that may give you some inspiration on how to build your next dashboard. The example below will provide some good ideas on which charts, dimensions and metrics to use to visualize your Ecommerce data. Please note that some of this data will be available only for accounts that have Enhanced Ecommerce implemented. Let’s go over some of the elements you see in the screenshot above. Header: it is always helpful to provide some info and controls in the top of the report. In this case you will see the website logo, a time range control and a series of four filter controls, with which you can segment your reports by Device, Country, Source or User Type. Trend charts: the four line charts in the top left will show how the business is performing over time (also compared to the previous period). This is important to understand drops and spikes in the data. Scorecards: the overall stats (green background) show in a glance how the business is doing, they provide a quick and effective way to understand the bottom line. Detailed information: tables are the best way to represent data in a detailed way. As seen in the report, the tables provide more information about the products being sold and also the traffic sources bringing the most users. Additional info: depending on your business, you might want to add special metrics and dimensions to enrich your report (e.g. custom dimensions & metrics). In the report above you will find some additional information on the bar and pie charts in the bottom right corner. We hope that this sample report helps you get up and running. Feel free to share your own report in the comments, we would love to learn how you are using Data Studio to report and visualize your data! Google Data Studio is a great tool to visualize datasets from multiple sources, such as Google Sheets, BigQuery, AdWords, and others. But being part of the Google Analytics 360 Suite, it is no surprise that it makes a perfect visualization tool for Google Analytics too! In the coming weeks and months we will showcase some best practices and sample reports in this blog, but we thought we would start with something you are acquainted with: Google Analytics. is our new Business Intelligence product that makes it easy to connect, visualize, and share data. Today we updated the Google Data Studio AdWords connector to be more flexible and easier to use. 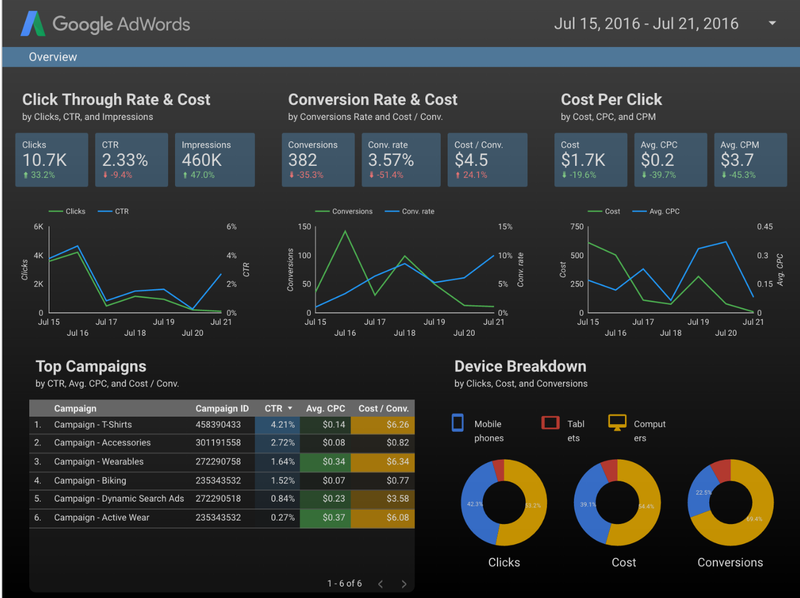 The AdWords connector allows AdWords customers to access their AdWords account data in Data Studio, build visually stunning reports, and share those reports to business stakeholders across their organization. 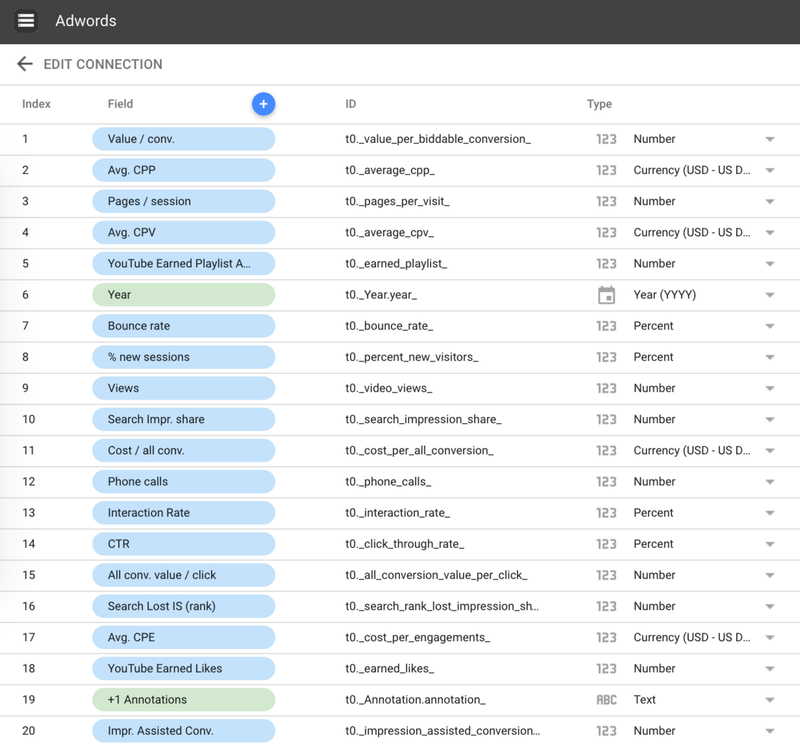 With our recent update, the new AdWords connector now unifies over 100 AdWords dimensions and metrics as a single list, making it easier select the data you want to visualize. 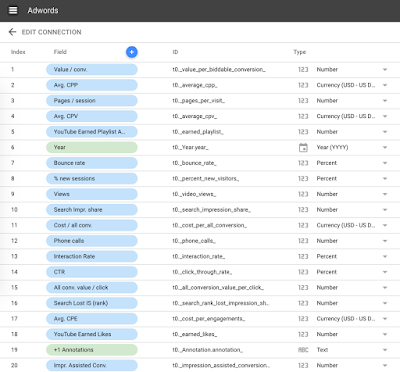 The new connector also supports many more combinations of dimensions and metrics, dramatically simplifying building reports. Of course, when you build AdWords reports with Data Studio, all the existing Data Studio features are compatible with this data including: calculated metrics, derived fields, custom visualizations, rich styling and custom branding, simplified sharing through Google Drive and realtime collaboration. These new changes are available today in both Data Studio 360 and Data Studio versions. To use the new connector, you must create a new Data Studio Data Source. Data Source using the previous connector will continue to work. Please read our help documentation on how to migrate to the new version. 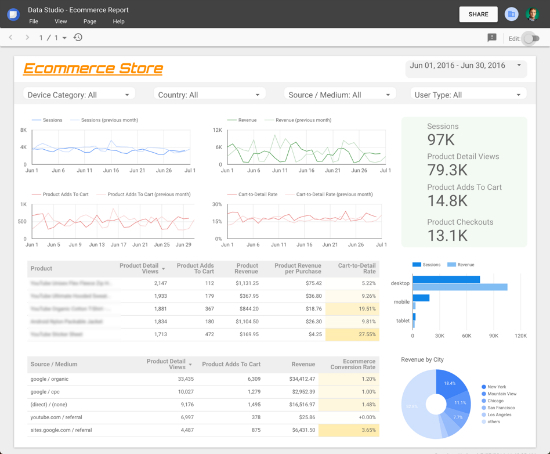 We’re excited to see all of the new reports customers will create with this enhancement. Google Data Studio is our new Business Intelligence product that makes it easy to connect, visualize, and share data. 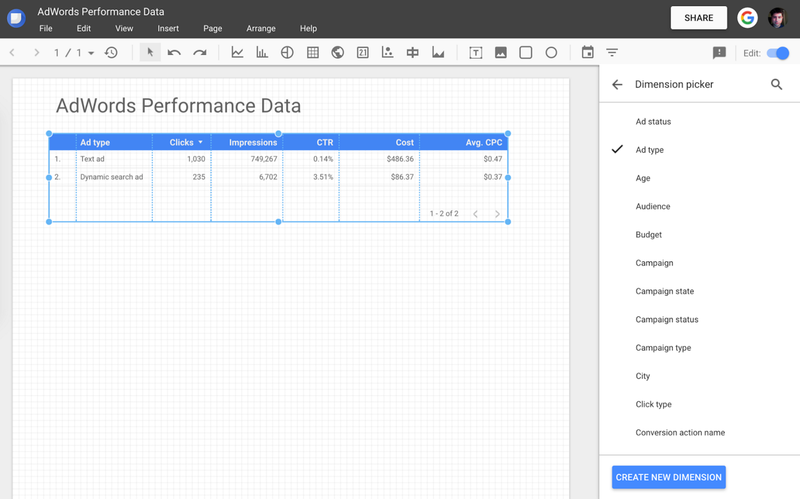 Today we updated the Google Data Studio AdWords connector to be more flexible and easier to use.